Anonymous has began a series of Attacks against the Elite and their Banks starting first with Phase 1 in 2011. Yes that’s right you read that right, OpIcarus started in 2011 in conjunction with Occupy Wall St. It has been revealed exclusively to We Are Change by several Anonymous source’s within the Hacktivist Collective that the recently revived #OpIcarus was started in 2011. If you are new to activism and We Are Change, you may not know but years ago in 2011. Many of us Activist, Hacktivist and whoever else camped out all over the world for the largest protest in history known as Occupy. Before occupy, Anonymous planned several attacks on the banks just like with Phase 2 earlier this month. The Second phase, of OpIcarus was against the Central Banks and Banks which we reported last week. The Third Phase of OpIcarus has just been launched and its against the Stock Exchanges of the world and now during the third phase Anonymous has also taken down the Bilderberg group’s website with another series of DDoS Attacks to show them we are watching the world is waking up. Anonymous has successfully launched DDoS attacks against the NYSE Euronext Market, the London Stock Exchange, Nasdaq Baltic, the Philippines Stock Exchange, the Lao Security Exchange, the Turkey Stock Exchange (Borsa Istanbul), the Athens Exchange Group, and the Panama Stock Exchange and more . Anonymous is also reviving the infamous #ProjectMayhem, with the Third Phase of OpIcarus declaring Global war on the Rothschild’s, Banking Cartel, Zionist, Bilderberg Group and various other elite group’s and Governments. Leaving a clear message to the Global Elite in a “Fight Club” reference. The Collective has promised that they aren’t going away they warn that the attacks will continue for as long as the Global elite continue walking their war mongering paths and global agenda’s against the population their kids your kids and grand kids. To the Elite, its time to give up your goal of a “New World Order” whether its journalist, activist or hacktivist we will never bow down and obey we will not submit you are not gods. The Collective Also hinted that there would be a Phase 4, but stating they were not sure at the present time what that phase would be. I had the privilege to receive an exclusive information leak from the Hacktivist collective on the condition that Anonymous gets the credit the entire collective and that this is published as a leak and not an Interview like the previous written article. I was also told at the time of this writing, 6/10/16 that they would continue targeting Bilderberg’s website to show that they are watching. 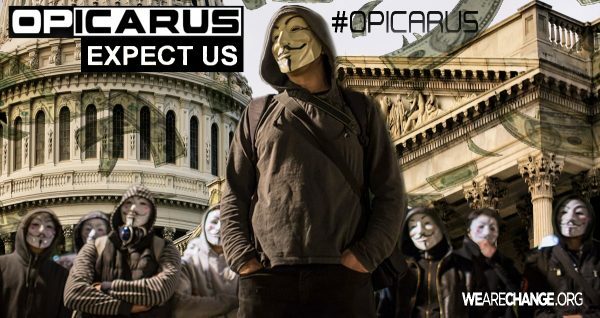 So sit back grab some popcorn or crumpets if you are British and enjoy this leak of information regarding #OpIcarus that takes us all down memory lane. “The third phase we all made a group decision to fight the stock exchanges found on this website . The internet really did make it easy for us to recon a mass amount of targets for the next month. We are still not sure on our future because as time goes on plans change or new idea’s are brought up that we all like so its hard to really say what the next phase could be as we haven’t decided what phase 4 could be yet. The third phase is different because we are targeting stock exchanges instead of just central banks around the world owned by the Rothschild family. But as the hashtag #Projectmayhem suggests if anything is brought up in the media in the meantime like the Bilderberg Meeting we will go out of our way to make sure we attack such matters so it is impossible for them to not know that we are fighting them. We decided hitting the Bilderberg as a mass would send a clear message to the attendees that people are waking up and noticing there is a higher elite controlling our politics. Opicarus has been so successful because its been an idea that started several years ago, its taken years to finally grow to what it is now. That’s what makes opicarus different, the ability to see an idea grow is beautiful. Seeing a very large mass of Anons sharing the same mind set, it’s beautiful because we all spend hours doing our own research to see a community reach the same end point is rather glorious. Once Occupy became hijacked by Soros and Anonymous was having its own internal problems caused by Sabu, the Operation was put on hold until now. last month we let them know that we were paying attention and watching them with the success of OpIcarus Phase2. this month it will be an ultimatum. either they stop, or they can keep on expecting us. But we will never stop. The community is currently setting the media for a target as we tend to shift our target to any corruption this month and we will push our lasers to those countries that get involved in corruption. Once the recon has finished if we haven’t found a target we will continue to hold down the bilderberg meeting. Like we had our eyes on Europe the other day when we hit New Guinea, but then people started to post that 4 protesters have been shot and 20 injured so we all decided to attack new guinea. Its clear when these attacks on our citizens happen these decisions trickle down from higher powers. We strongly believe the police have open minds they just need to wake up and realize they have the power to refuse such decisions like shooting innocents fighting for a better life. We managed to hold down their main bank for most of the day and a few government + finance websites. This is why we use the hash #projectmayhem those caught in such horrific incidents will find themselves becoming a target during this month. The entire financial system and all the elite that control it need to be under complete scrutiny from now. We are stages away from entering a 3rd world bankers war fueled by nothing more but greed, power and hate for fellow human beings. We have decided to detach ourselves from that system as it no longer represents the masses. The elite have become a security risk to us all. And its time for us to fight back. Imagine the corrupts start to fear us. When the people fear the government, there is tyranny, But when the government fears the people, there is liberty. People shouldn’t fear of their government. Governments should fear their people. Four billion years of evolutionary success encoded deep within the fabric of every strand of our DNA. Four billion years of evolutionary success has brought us here. A turning point for humanity, into a new eon. An age where light has pierced into darkness illuminating all things.. We are all absolutely FREE! there are no rulers, there are no masters, there is no elite. The time to take control of our reality is now. This is the time to wake up, this is the time to expose all lies, this is the time we ascend from darkness. Imagine we shut it all down. Einstein Said there are two infinite things, the universe and humans stupidity, the latter end is for us to prove the contrary. Ultimately, What is the purpose of a science capable of sending a man to the moon, but unable to put a piece of bread on the table of every human. Humans now has enough technology to make happy each person on the planet. You agree the social degradation because you’ve never known anything else.Our planet does not belong to anyone. Our planet is our house to all, the sky is our roof, humanity and all life forms are our family. We must all help to show the right path to each brother and sister of our big family humankind. Stop the division among ourselves, stop being selfish, live for all of us we are a big family. Now it’s to you to choose the future you wish leave to your children. there are two possibilities, either you continue as now and one day the human being will destroy itself or you become conscious of you are a big family, and it’s time to rebuild a better world than now. Now it is for the majority to retake control of the planet. We do not want violence, and it must not happen because there can be no loser. You will all win. It can never be a perfect world, but it is easy to make a better and more just one. Behind the clouds, there’s always the sun, we are the sun, we are Anonymous. We will not forgive. We will not forget.